Never had I ever thought that I’d spend 2 weeks in rural Peru, helping spay and neuter dogs and cats. My friends all thought I’d die there, due in large part to my extreme technophile nature and complete lack of Spanish knowledge and culture. But that’s exactly what made this trip so unique and exciting. Like traveling to any country for the first time, the first hour is the most eye-opening. I hopped off the plane into a sea of humidity and blinding sunlight. Once I passed through customs, I recognized a word assaulting my ears: TAXI! An abundance of head shaking proceeded as I scanned the gate for my name, hoping my free ride was present. Luckily, Sergio was there, and we sped off on his moto-kar to town. Yes, this is essentially what everyone drives around town. And it has a ridiculously surprising amount of horsepower. 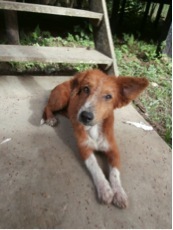 After getting through rural Belen, Iquitos, where the roads are just dirt, pocketed with moto-kar sized puddles and hills that would make any dirtbiker excited, we arrived at the dog shelter where I’d find myself staying for the next two weeks. I was greeted by over ten excited dogs, barking up a storm and sniffing everything possible. And although he was covered in fleas and smelled like wet dog meets rotting eggs, Manuel was the cutest one of the bunch. As I stepped into the shelter doors, I was greeted with a fantastic platter of fish, rice, salad, and fries. The ever persistent fries were present at 90% of the meals along with fresh juice that can only be described as ambrosia for the gods. That day, I met Katarina, a vet from Czech Republic who owns her own clinic. The following day, Danielle and Ana arrived, a second year from VTech and a resident in Britain, respectively. Throughout the next two weeks, we learned about each other and helped one another grow become accustomed to life in Peru. Our first day running treatments and surgeries was an exciting mess of meeting new people, learning how to organize and manage roles, and avoiding having rainwater fall into the surgery site. I was given the opportunity to place at least 5 catheters, give IM and SQ injections, and glove up to help the surgeons on just the first day. In the days that followed, I learned, performed, and then taught cat and dog castration and sutured spay incisions. With only 5 vets, and 2 techs, we ended up performing over 300 spays/neuters over the course of 2 weeks. Each day had new surprises in store as well. 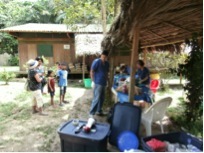 We were a mobile clinic, so we would never be in the same place more than twice. One day at a government office, the next at a schoolhouse, and a couple days at a fish market. The second week we traveled on a boat to the surrounding islands, working at a gynecologist’s office, utilizing the stirrups table as a pre-med prep station. We had to be innovative and find ways to work around any situation. It kept every day interesting. We were lucky enough to have a couple off days as well. And considering our close proximity to the Amazon, there was no better option for a 1.5 day trip. We visited the Yagua tribe and participated in a blowgun competition with them. 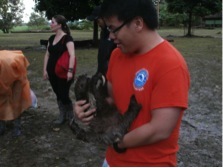 We held sloths, macaws, monkeys, and black caimans at an animal reserve and found green iguanas and nocturnal mammals. The lodge even had a room with over twenty hammocks. It was a great way to mix in fun and exploration with the spay/neuter trip. I couldn’t have asked for a better two week experience.